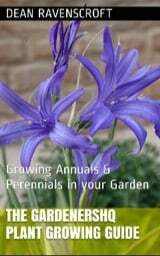 Guide to Growing California Fuchsia, Zauschneria, and Hummingbird Flower. Zauschneria are half hardy perennials that range from 30 to 60 cm in height. They bloom from summer through to the start of autumn when they carry red hanging tubular flowers. The foliage is greyish green. A common variety grown in gardens is the California Fuchsia. Zauschneria californica by Derrick Coetzee. Common Names: California fuchsia, Zauschneria, Hummingbird Flower, Hummingbird Trumpet, Firechalice, Northern Willowherb. Height: 12 to 24 inches (30 – 60 cm). Flower Details: Red-orange, pink. Racemes. Tubular, funnel shaped. About one inch (2.5 cm) long. Foliage: Widely variable (Zauschneria has numerous subspecies). Green, grey to white. Opposite or alternate. Lanceolate or ovate. Sow Outside: Surface. Spring. Germination time: one to two months. Space at 15 to 18 (38–45 cm). Nursery bought plants should be planted out after the last frost. Requirements and care: Full sunlight or partial shade. Good drainage. Neutral to slightly alkaline soil pH 7 to 8. Most soils. Protect from the wind. Protect from heavy rain. Pinch tips of seedlings to encourage bushiness. Deadhead to improve appearance. Propagate: by dividing in the spring or take stem cuttings in the autumn. 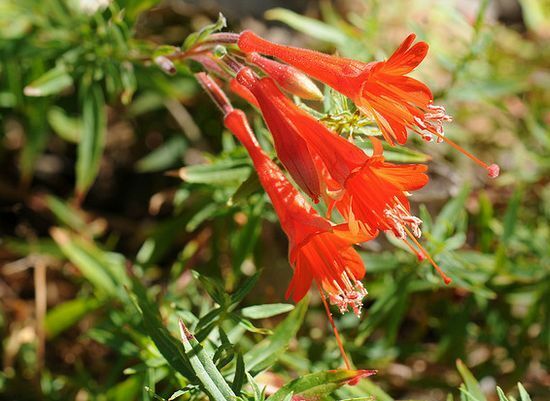 Miscellaneous: Zauschneria plant species have now been reclassified into the Willowherb (Epilobium) genus, and are now known as Epilobium canum (California fuchsia) and Epilobium septentrionale (Northern Willowherb). As their common name suggests, these plants are especially attractive to Hummingbirds, which pollinate the plants. Plants can become invasive, so consider growing in a contained area. When growing California Fuchsia and related species from seed it is best to start them off outdoors. Sow the seeds in the springtime on the surface. Zauschneria plants should be spaced at about 40 to 50 cm apart, and they are able to grow in either a sunny or partially shady part of the garden. It is important that the plant grow in soils that have good drainage; a slightly alkaline to neutral pH of 7 to 8 should give best results. They usually take one or two months to germinate at a temperature of 15 to 18 degrees centigrade in the light. Once Zauschneria becomes established pinch back the young tips; this will encourage branching and result in a bushier growth. Dead head the plants regularly. They are drought tolerant, so they have no special watering needs.